Ever had a sprained ankle? A real one–not a twisted or rolled ankle, which hurts too, but not in the same way a sprained ankle does. Sprained ankles are not fun. They hurt worse, in my opinion, than some broken bones, which hurt much less once they’ve been set. Not sprained ankles, though; they keep hurting for weeks, months, and for some even years afterwards. Ouch! A new study published in The American Journal of Medicine showed that, although people who suffered ankle sprains got back on their feet quickly–some within two weeks–some continue to have problems for months or years following the injury. Being the most common sports injury, very little is known about the recovery process of sprained ankles, at least according to the study. Huh!?! Further, the risk of re-injuring the ankle was as high as 35%–the highest risk group being people highly active in sports. Very, very interesting conclusions out of Rotterdam, the Netherlands. Being a chiropractic sports physician, I’m a bit amazed at the uncertainty of long-term ankle sprain prognosis. I don’t find any of the results unusual. Many, many ankle sprains are due to heightened risk caused by foot dysfunction. People who have gait abnormalities due to foot dysfunction have a tendency to roll their ankles. Throw these people on a basketball court–like your’s truly–and you increase the risk of ankle sprain exponentially. The solution–a pair of custom-made orthotics. 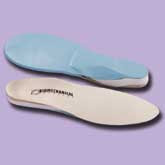 Orthotics are support devices that fit in the shoes. They correct for common dysfunctions of the foot and ankle–overpronation, oversupination, failure to extend the big toe, and so forth. Correct these dysfunctions and the incidence of repeat sprained ankles goes way down. I’m shocked there was nothing mentioned about orthotic support in the study’s report. I know the incredible results obtained through orthotic support personally–been wearing them for years, never another sprain–and professionally. If you’ve had a sprained ankle or have never fully recovered from one, find a qualified health practitioner, and have you feet evaluated for dysfunction. And if you need them, get a pair of custom made orthotics–they’ll change your life. I recently re-sprained my ankle running even though I was wearing an orthoctic. But I do agree that they do help and lower the risk of it happening. Thank you Xavier for bringing up a great point. People that have foot dysfunction are at an increased risk of rolling their ankles, which can themselves lead to frank sprains. As someone with foot dysfunction, I would regularly roll my ankles just walking down the street–no pothole nor stepping off a curb wrong–it would just happen. That doesn’t mean that I would sprain it, though; just that I was more susceptible to a sprain. Saying that, anybody involved in sports (which includes running, jogging or power-walking) can suffer an injury, including ankle sprains. So I don’t mean that orthotics will prevent a sports injury, but it does prevent chronic rolling, and thus decreases the probability for an ankle sprain.